There's a reason Mixed Blood Theatre was the Twin Cities Theater Bloggers' pick for most accessible theater in 2016 (and best use of social media, BTW). Actually there are many reasons - their Radical Hospitality program in which all available tickets are free two hours before the show; their recent remodel which makes the building more accessible for artists and patrons of varying abilities and includes new spacious all-gender bathrooms; their commitment to hiring theater artists of all races, classes, gender identities, and abilities; and their programming, which often features people whose stories aren't usually heard. On the surface the world premiere play Corazón Eterno (Always in My Heart) isn't very revolutionary; it's a sweet, funny, simple love story, nothing we haven't heard before. But the novelty is that it's performed in both English and Spanish, with surtitle translations to Spanish and English. According to Wikipedia, Spanish is the second most spoken language in the US, and the US is the third largest Spanish speaking country in the world. It's wonderful to see that statistic, that reality of our world, represented on stage. Even more wonderful was hearing Spanish spoken among the audience on opening night, and the enthusiastic response of the audience to the sweet story told in two spoken languages, and the universal language of love. In an unnamed country in an unnamed time in the past, we meet the elderly couple Julia and Julio. Their names and the way they sweetly bicker may say that they're meant for each other, but as Shakespeare wisely noted, "the course of true love never did run smooth." Corazón Eterno is basically an expansion of that idea to 80 minutes. For when Julio, at Julia's insistence, begins to tell their love story, we learn about their unsmooth history. Obstacles they face include Julia's overprotective father who doesn't want his daughter marrying a bike messenger; geographical distance; other love interests; Julio giving up his dream of being a musician to become a successful businessman because he thinks it will impress Julia and her father; and the passage of time. We know the couple gets back together eventually, but watching them get there is a charming, if at times frustrating, experience. Playwright Caridad Svich (who also wrote the last bilingual play seen at Mixed Blood, In the Time of Butterflies), uses her two languages specifically. The young lovers Julia and Julio speak English with each other, but speak Spanish with their father and mother, respectively, in the way that many Spanish speaking families (I'm assuming) speak Spanish at home and English out in the world. The effect of this in the story is a feeling of greater intimacy in the familial relationships, and more of a formality as Julia and Julio get to know each other and fall in love. In that way I almost wish that at the end of the play Julia and Julio began to speak Spanish to each other, which would have reinforced their joining together and becoming each other's family. Still, as someone who knows almost no Spanish, it's lovely to experience the fluid beauty of the language, with the surtitles to clue me in on the meaning of the words. The five-person cast, directed by José Zayas, is wonderful and really creates a family feeling. Israel López Reyes and Mariana Fernández are charming as the young lovers, who convincingly transform to old lovers. Raúl Ramos manages to make Julia's overbearing father likable despite his interference, making it clear he's doing it out of love for his daughter. Lisa Suarez is warm and funny as Julio's tough but supportive mother, and Sasha Andreev is charismatic as always as the third point in the love triangle. The play takes place in a park, in the family homes, in a doctor's office, on a train, so how to solve this scenic challenge? Set designer Abbee Warmboe's solution is to use the same garden set for the whole play, leaving the details of location to our imaginations. This works well for what is essentially a memory play, giving it a sort of fairy story feel in the charming garden with overturned columns and tiny cherry blossoms. Amber Brown's vaguely period costumes also work for the unspecified timeline, with Julia's sweet and simple dresses matching the tone of the story. 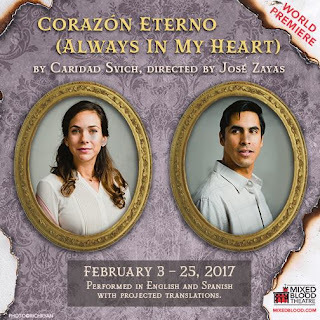 Corazón Eterno (Always in My Heart) continues on Fridays and Saturdays only through February 25. Check it out if you're a Spanish speaker, or if you're in the mood for a sweet little love story.